No one will be too shocked to see which 55+ community was most popular on 55places.com in October. Back in May, 55places.com announced the 100 most popular active adult communities of 2018 as a way to highlight the places that 55+ buyers are focusing their attention. We thought it might be a good idea to check back in with our audience to see which communities buyers have their eye on now that the end of the year is fast approaching. We looked at 55places.com traffic between October 1 and October 31 and determined the ten communities that received the most visits overall. You’ll probably recognize a lot of these names as they’re among the most popular communities in the nation. It’s no surprise to see Latitude Margaritaville top the list. Not only is it always among the most popular communities on the site but it was featured in the final week of October on Wheel of Fortune, which gave away a free home in the community. It also helps that developer Minto recently released a new round of homesites. The impending arrival of many amenities inside the community and a shopping center just outside of it will likely keep interest high. After topping the popularity list in September, OTOW returns to its usual No. 2 spot on the list. The appeal of OTOW is in its ability to provide residents with just about anything they can think about doing. With three golf courses, several clubhouses, fitness centers, swimming pools, tennis and pickleball courts, restaurants, an R/C airplane field, and an R/C car track, no one runs out of things to do here. One resident recently told us it’s “adult Disney World” and it certainly sounds like it. It would be weird not to see The Villages on any kind of most popular list. 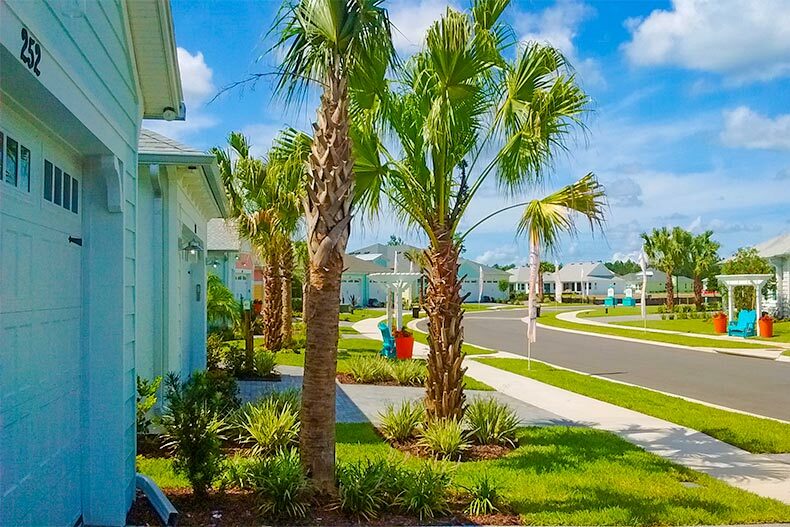 Spanning three counties, three zip codes, and over 20,000 acres, The Villages is really its own city made up of hundreds of communities. You could move into a residence here, never leave, and have all of your daily needs met, including entertainment, healthcare, and educational. No wonder there are so many myths and rumors about this gigantic, sprawling community. As one of New Jersey’s top retirement communities, Holiday City at Berkeley has consistently charmed residents throughout the years with new home styles, floor plans, and amenities. Today, they keep people interested by offering a wide range of options at a great value with all the clubs, activities, and recreation you could ask for. This large 55+ community is divided into five sections, all of which have a clubhouse, pool, retail stores, restaurants, and banks. Solivita is another 55+ community that always seems to be near the top of any kind of popular list we do. It’s easy to understand why. “It is a large enough community so that it offers a variety of things to do, people to meet, and consistent activities, but is small enough to give that small-town feel,” according to 55places.com partner agent and community resident Jamie Dorn. Not everyone retires in Florida and Arizona. For those who want to stay in the Midwest to be near family or everything Chicagoland has to offer, Sun City Huntley in Illinois remains one of the most popular across the site. The largest and most amenity-laden 55+ community in the Midwest is centered around a 94,000 square-foot clubhouse but also includes a second clubhouse, hundred-acre park, cafe, and golf course. For more than 50 years homes have been constructed in Sun City Center, one of the largest 55+ communities in Florida. Now, the development has reached its final build-out and the last new home has been sold. Clearly, readers are interested in finding out where the community goes from here as there are plenty of resale options available to potential homeowners preparing a move to the Tampa Bay area. Ocala remains a very popular destination these days for buyers thanks to a mixture of reasonable prices, plenty to do, and some of the best active adult communities in the region. Oak Run ranks among the most popular communities thanks to a collection of reasonably priced resale homes and a robust lifestyle offering over 100 clubs and interest groups. There are plenty of 55+ communities around the country that include the Sun City name these days, but there was only one original Sun City, which opened in 1960. It’s kept up with the times, however. Now, the community includes over 26,000 homes, 11 golf courses, and countless amenities and social clubs worth exploring. The third Del Webb active adult community in Phoenix's northwest valley is as popular as ever. That’s due to Sun City Grand’s impressive lineup of amenities, social activities, and golf courses. Between the four golf courses and five different amenity centers, multiple pools, and the ASU Lifelong Learning Academy, there is no shortage of things for residents to do. The 45+ age-restriction also means residents can consider getting in early and settling in for all that fun ahead.